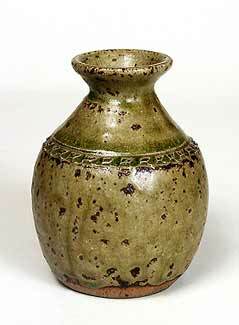 Paul Green bottle vase - 4⅛" (104 mm) high. Visitors to Cerne Abbas in Dorset, famous for its Cerne Giant - a 180 ft chalk figure that has been an attraction for 1500 years - will find Abbey Pottery, named for the town's 10th century abbey, and the workplace of Paul Green. Paul attended Chester School of Art and had his first workshop in Wensleydale, Yorkshire. His current workshop was established in 1986, and produces domestic wares and decorative porcelain. The work is mainly hand thrown and fired at high temperature using a variety of glazes.